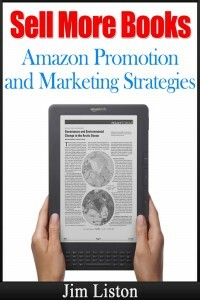 My new eBook, “Sell More Books: Amazon Promotion and Marketing Strategies is available on Amazon. You’ve spent hours creating your story, now it’s time to make sure the millions of people who visit Amazon every day can find it. Detailed instructions to fine-tune your product description. Up-to-date information to choose the appropriate categories. Specific directions to find the correct keywords. Help setting up your Amazon Author Page. Guaranteed ways to get more reviews. Help using Kindle Promotions, including links to over 35 sites that will list your eBook free. Tips for marketing your eBook on Facebook, Twitter, Pinterest, & other social media sites. So, if you’re new to eBook marketing, or just want to learn some new tips, let’s Sell More Books! Jim opens his `how to book’ with a question: `What’s the difference between promotion and marketing? Promotion is about telling a prospective customer that your book is available. Marketing is convincing that prospective customer to pull out their wallet and purchase your book.’ And that is the friendly but very helpful tone with which Jim writes this book that is specifically directed to Amazon promotion and marketing. He offers writing tips on how to phrase your PR and marketing blurbs, finding competitive keywords, selecting the correct category for your book, making sure your author page is complete, dealing with reviewers (the dos and don’ts of seeking reviews), using Kindle Free Days correctly and wisely, promoting on social websites such as Facebook, Pinterest, Twitter etc – all to increase you online visibility. This book was like a Godsend to me. I was literally stopping in my reading to do some of the tips suggested by the author. Thanks a bunch Jim. I’ve spent a lot of money on the Internet promoting my books, and the price I paid for this one book is like a drop in a bottomless ocean that had been sucking the life out of me. As I practice these tips, I am confident, I too will soon become an expert, it’s that simple. Highly recommend. There are a lot of people out there offering advice to writers and a lot of them really don’t know what they’re talking about. This book is the real deal. It starts off with some very basic concepts (the difference between “marketing” and “promotion” for example, but then it gets into what the author calls “the good stuff.” And it is very good stuff indeed: strategies for getting reviews (hint: forget friends and family) and a link to a terrific article on using Pinterest. There’s solid advice on crafting engaging tweets, maximizing your author page and more, more, more. This book will give you a short course in marketing that’s more like a master class. JimsGotWeb offers promotion and marketing help to indie-authors. From editing your book to make sure it doesn’t have spelling and grammatical errors, to helping you promote your “Free Days” and “Countdown” promotion, we can help! I’ll help you with your Amazon promotion by submitting all of the necessary information to promotion websites and Facebook groups; including your book’s link, cover, description, dates of promotion, promotion price, and your author bio. I will read your book and write a powerful description, with HTML included. I will contact reviewers on Amazon and Goodreads to get more reviews for your book. After reading your book, I’ll check keywords on Google and Amazon to find keywords that will bring a large amount of traffic to your book. After reading your book, I will choose appropriate categories so you’re book can rank in the top 100. One of the biggest complaints from readers leaving negative reviews is misspelling, incorrect grammar, and improper word usage. Let me proofread your book to make sure there aren’t any problems. Readers do judge a book by its cover, it’s the first thing they see. I have illustrators that can make you a new cover, if needed, or they will help improve your current cover to make sure it looks professional. If you need help setting up a Twitter, Facebook, or other social media accounts, I can do that for you and help you get “Likes” and “Followers” to your account. I’ll set up a professional looking WordPress website that’s easy to maintain, so you can easily communicate with your readers. I can convert your Word document into PDF, .mobi and .epub formats for all reading devices. This is great for sending out free review copies to readers. If you have promotion and marketing needs, let JimsGotWeb help. Social Media has changed the face of traditional advertising and customer interaction forever. With billions of consumers utilizing social media daily, a consistent online presence offers huge returns. Being active on sites like Facebook, YouTube, Twitter, etc., is pivotal in maximizing efficiency of your business advertising.